The Single Electricity Market (SEM) is the wholesale electricity market for the island of Ireland. It is jointly regulated by the Utility Regulator and the Commission for Energy Regulation. The decision-making body which governs the market is the SEM Committee (SEMC). The SEM is undergoing significant change. EU legislation is driving the coming together of energy markets across Europe with the aim of creating a fully liberalised internal electricity market. The SEMC is leading on meeting the requirements of the European legislation by developing and delivering a new wholesale market on the island of Ireland. The new wholesale market will be known as the Integrated Single Electricity Market (I-SEM) and must be in place by the end of 2017. As well as building on the SEM, the I-SEM will deliver increased levels of competition which should help put a downward pressure on prices as well as encouraging greater levels of security of supply and transparency. In February 2014, the SEMC launched a consultation on the High Level Design options to deliver compliance with the target model. Details of the preferred High Level Design were published in September 2014. The SEMC is now overseeing the detailed design and implementation work needed to go-live with the new market. 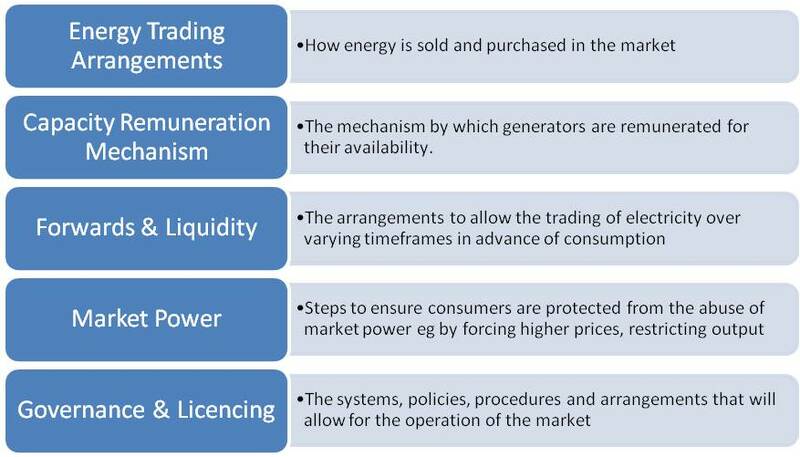 This includes detailed design workstreams which include the Energy Trading Arrangements, Capacity Remuneration Mechanism, Forwards and Liquidity, Market Power and Governance and Licensing. The Regulatory Authorities (RAs) are also working with the Transmission system Operators and market participants to ensure the necessary systems and processes are in place to aid market readiness.